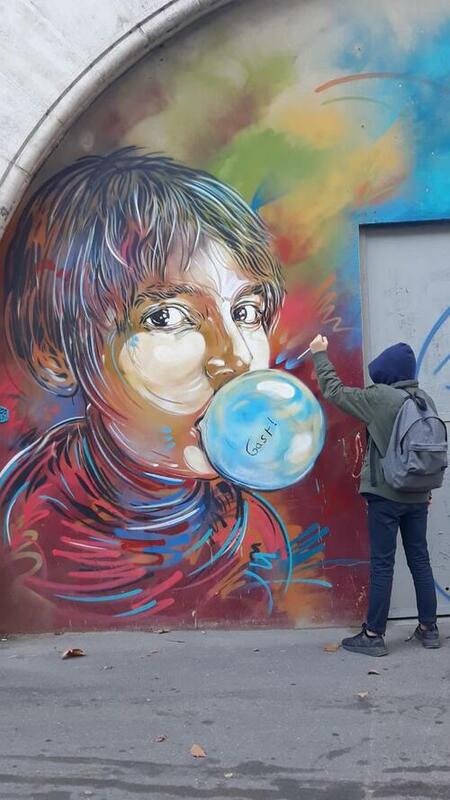 In this artwork we can see a boy dressed like a teenager with a hood (we can't see his face) and a backpack.He tried to puncture the bubble gum of his friend with a pencil. 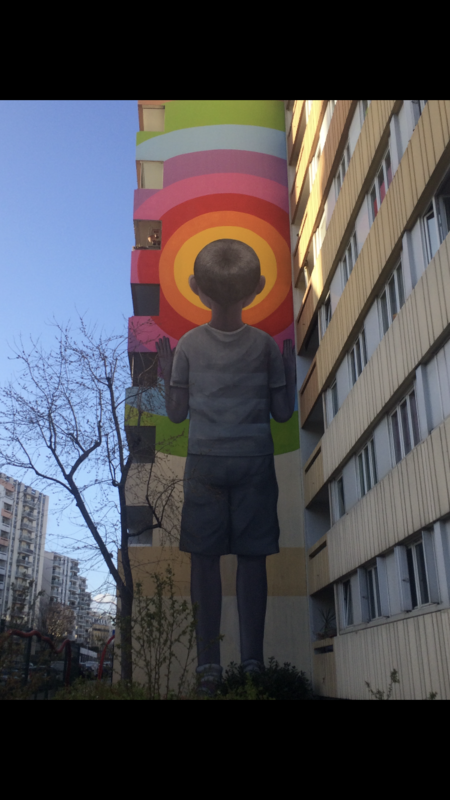 It's a colourful picture.This artwork is in Paris under the Parisian metro (overground) near Nationale station. ​The little boy is trying to destroy the bubble of his friend because he may jealous and maybe he doesn't know how to do it. ​The message is that when you don't know how to do something but your friend does, you shouldn't get jealous and mean but you should ask him for help or advice. It's a peaceful message. I really like this artwork because it is very funny and the message is witty. The tag is beautiful and the boy with the pencil is also beautiful and strong. It was created in my town and I love it. I'm standing in front of a graffiti which was created on February 24, 2019 by a group of 30 artists from the "gilets jaunes" in the Poterne des peupliers street. 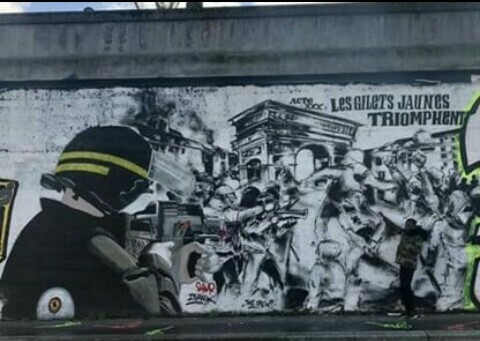 It is part of a mural that denounces police brutality during the demonstrations of the gilets jaunes in Paris. The gilets jaunes have been demonstrating every Saturday for several months. On the right of the picture, I tried to stage myself and pretended to be demonstrating with the "gilets jaunes". On the left, the security forces are pointing their Flash-Ball on us and behind, we see "l'arc de Triomphe". At the top, we can read "Les gilets jaunes triomphent". I chose to pose with this graffiti because it is a hot topic which interests me a lot. It delivers a strong political message and it's a beautiful piece of artwork. This document is a painting and it is untitled. 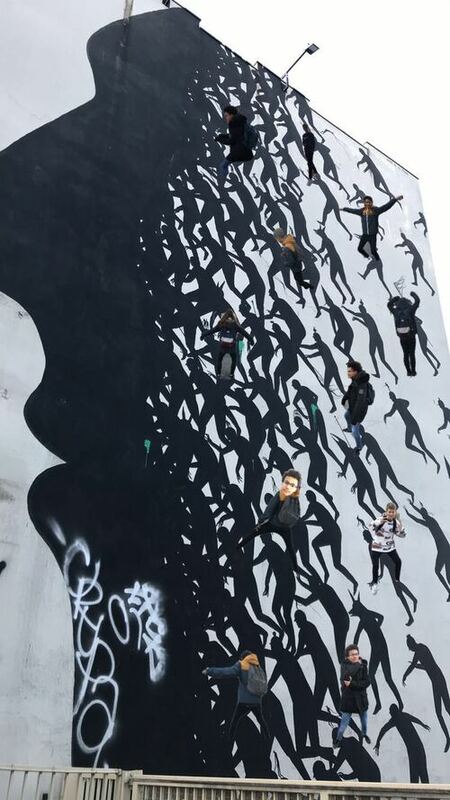 It was painted by the spanish artist David de la Mano in 2015. It is about 20 meters by 10 meters. It can be seen in Paris in the 13th district, in Jenner street. We can see someone in profile and behind him, a lot of fantastic and odd characters which are mixing up with the profile. The whole painting is black. The artist has painted a mural which shows human society. We have chosen this painting because we wanted to put funny pictures of us to bring some happiness into this sad and drab drawing. We think that human society is boring but that we can make this society happier by being different. We also loved making the photomontage. It was very amusing to strike poses and then put ourselves into the painting. 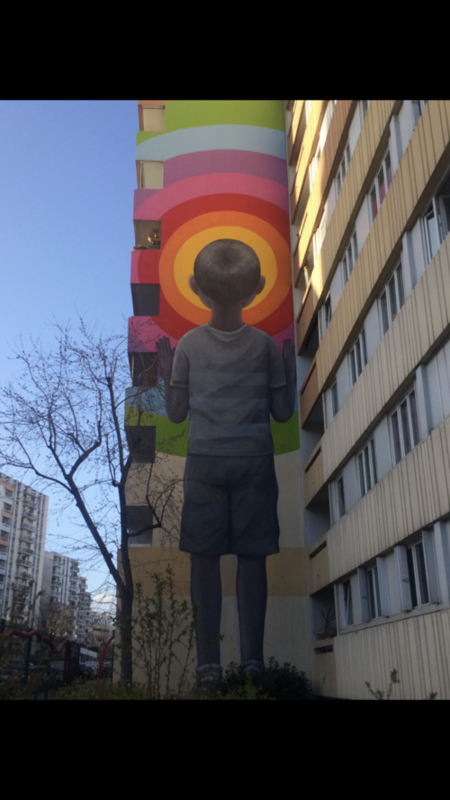 This is a mural that can be seen on the street « Rue du Docteur Magnan”. It represents a woman who seems to be dancing in a circle. We decided to colour the woman in black and white while we left the rest of the mural in blue, yellow and purple. Why ? Well, give us your opinion about it! 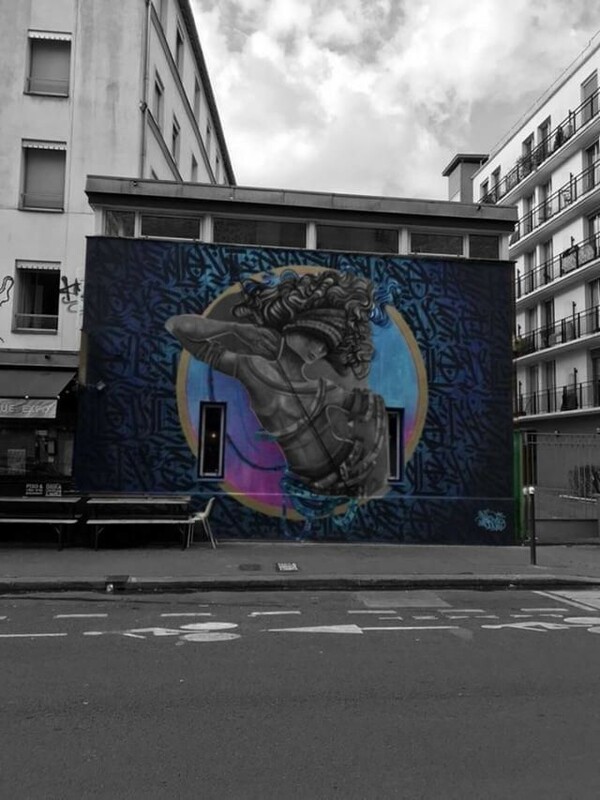 It's a piece of artwork named "Bambin" which is on a wall in Paris. ​It shows a child's back, in shorts who is looking at a circular rainbow. His head is in the middle of it. ​The little boy is black and white, and he is alone. ​This artwork may represent a boy who is sad because of society. The rainbow might symbolize the child's ideal future.